Collaborative Robot Grippers Modern Machine Shop 63 become available to provide guidance for inte- grators and end users. ISO released the TS 15066 technical specification in 2016, which supplements previous safety requirements for collaborative robot systems. This report o•ers guidance to per- form more sophisticated risk assessments for given applications. It also sets basic safety standards for cobot grippers, including the elimination of sharp corners and potential pinch points. It limits the gripping force to less than 140 Newtons so that if the gripper pinches someone, it will not cause injury. Schunk has developed a set of grippers, the Co-act line, which Mr. Walderich describes as "inherently safe" based on these standards. They have a soft housing with no sharp corners or pinch points, and their maximum gripping force is less than 140 Newtons. Mr. Walderich adds that Schunk was involved with the committee for another ISO technical report that is currently in final review, TR 20218- 2, which will provide additional guidelines spe- cifically for end effectors on collaborative robots. "There's still a lot of uncertainty in the market, and this ISO technical report that's focused on collaborative applications and especially end effectors is hopefully going to take some uncer- tainty out of the market and build some more trust into these applications," he says. 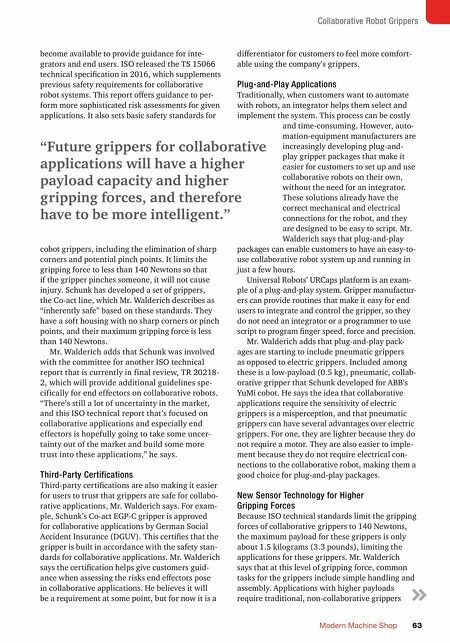 Third-Party Certifications Third-party certifications are also making it easier for users to trust that grippers are safe for collabo- rative applications, Mr. Walderich says. For exam- ple, Schunk's Co-act EGP-C gripper is approved for collaborative applications by German Social Accident Insurance (DGUV). This certifies that the gripper is built in accordance with the safety stan- dards for collaborative applications. Mr. Walderich says the certification helps give customers guid- ance when assessing the risks end e•ectors pose in collaborative applications. He believes it will be a requirement at some point, but for now it is a di•erentiator for customers to feel more comfort- able using the company's grippers. Plug-and-Play Applications Traditionally, when customers want to automate with robots, an integrator helps them select and implement the system. This process can be costly and time-consuming. 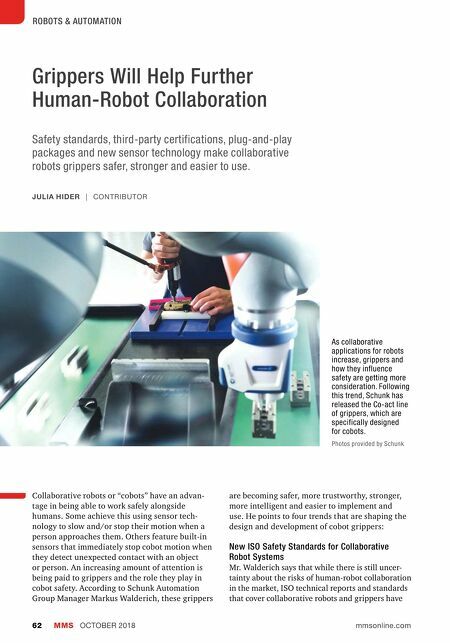 However, auto- mation-equipment manufacturers are increasingly developing plug-and- play gripper packages that make it easier for customers to set up and use collaborative robots on their own, without the need for an integrator. These solutions already have the correct mechanical and electrical connections for the robot, and they are designed to be easy to script. Mr. Walderich says that plug-and-play packages can enable customers to have an easy-to- use collaborative robot system up and running in just a few hours. Universal Robots' URCaps platform is an exam- ple of a plug-and-play system. Gripper manufactur- ers can provide routines that make it easy for end users to integrate and control the gripper, so they do not need an integrator or a programmer to use script to program finger speed, force and precision. Mr. Walderich adds that plug-and-play pack- ages are starting to include pneumatic grippers as opposed to electric grippers. Included among these is a low-payload (0.5 kg), pneumatic, collab- orative gripper that Schunk developed for ABB's YuMi cobot. He says the idea that collaborative applications require the sensitivity of electric grippers is a misperception, and that pneumatic grippers can have several advantages over electric grippers. For one, they are lighter because they do not require a motor. They are also easier to imple- ment because they do not require electrical con- nections to the collaborative robot, making them a good choice for plug-and-play packages. New Sensor Technology for Higher Gripping Forces Because ISO technical standards limit the gripping forces of collaborative grippers to 140 Newtons, the maximum payload for these grippers is only about 1.5 kilograms (3.3 pounds), limiting the applications for these grippers. Mr. Walderich says that at this level of gripping force, common tasks for the grippers include simple handling and assembly. Applications with higher payloads require traditional, non-collaborative grippers "Future grippers for collaborative applications will have a higher payload capacity and higher gripping forces, and therefore have to be more intelligent."